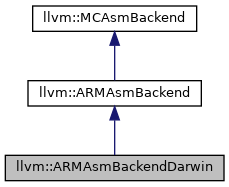 Definition at line 17 of file ARMAsmBackendDarwin.h. Definition at line 21 of file ARMAsmBackendDarwin.h. Definition at line 26 of file ARMAsmBackendDarwin.h. References llvm::MachO::CPU_TYPE_ARM, llvm::createARMMachObjectWriter(), and generateCompactUnwindEncoding(). If the CFI instructions describe a frame that cannot be encoded in compact unwind, the method returns UNWIND_ARM_MODE_DWARF which tells the runtime to fallback and unwind using dwarf. Definition at line 965 of file ARMAsmBackend.cpp. References contains(), llvm::MachO::CPU_SUBTYPE_ARM_V7K, llvm::dbgs(), DEBUG_WITH_TYPE, llvm::ArrayRef< T >::empty(), llvm::DenseMapBase< DerivedT, KeyT, ValueT, KeyInfoT, BucketT >::end(), llvm::DenseMapBase< DerivedT, KeyT, ValueT, KeyInfoT, BucketT >::find(), llvm::MCCFIInstruction::getOffset(), llvm::MCCFIInstruction::getOperation(), llvm::MCCFIInstruction::getRegister(), llvm::DenseMapBase< DerivedT, KeyT, ValueT, KeyInfoT, BucketT >::lookup(), MRI, llvm::MCCFIInstruction::OpDefCfa, llvm::MCCFIInstruction::OpDefCfaOffset, llvm::MCCFIInstruction::OpDefCfaRegister, llvm::MCCFIInstruction::OpOffset, llvm::MCCFIInstruction::OpRelOffset, R4, R6, Reg, llvm::ArrayRef< T >::size(), CU::UNWIND_ARM_FRAME_FIRST_PUSH_R4, CU::UNWIND_ARM_FRAME_FIRST_PUSH_R5, CU::UNWIND_ARM_FRAME_FIRST_PUSH_R6, CU::UNWIND_ARM_FRAME_SECOND_PUSH_R10, CU::UNWIND_ARM_FRAME_SECOND_PUSH_R11, CU::UNWIND_ARM_FRAME_SECOND_PUSH_R12, CU::UNWIND_ARM_FRAME_SECOND_PUSH_R8, CU::UNWIND_ARM_FRAME_SECOND_PUSH_R9, CU::UNWIND_ARM_MODE_DWARF, CU::UNWIND_ARM_MODE_FRAME, CU::UNWIND_ARM_MODE_FRAME_D, and CU::UNWIND_ARM_MODE_MASK. 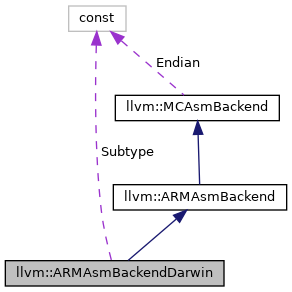 Definition at line 20 of file ARMAsmBackendDarwin.h.